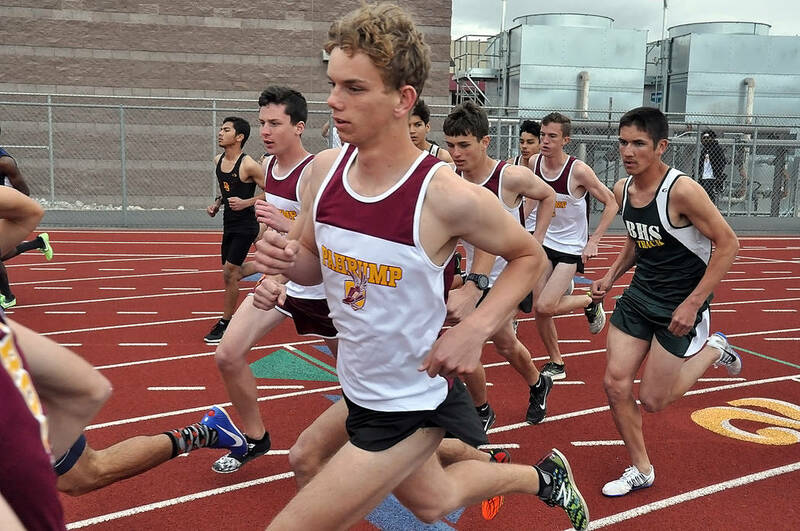 The Pahrump Valley track and field teams took a major step up in competition and did just fine for themselves, recording five personal records and six season bests at the O’Dea Relays on March 23 at Palo Verde High School in Las Vegas. 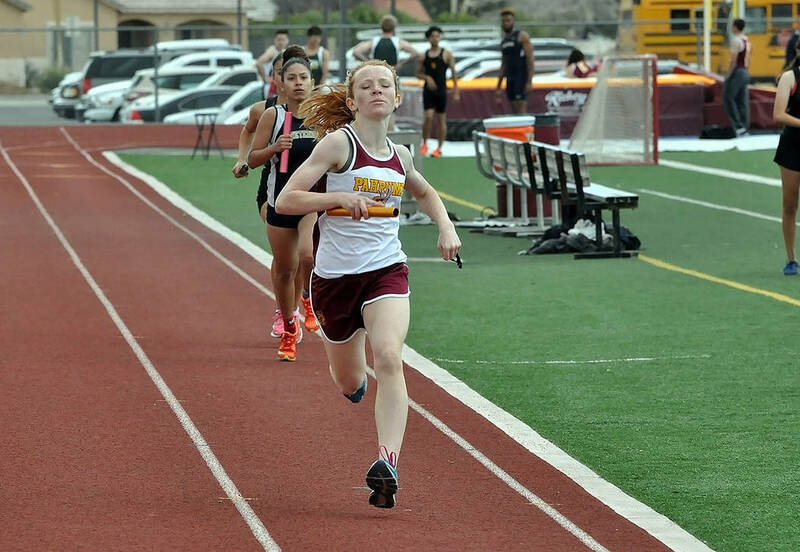 Horace Langford Jr./Pahrump Valley Times Pahrump Valley freshman Makayla Gent was a double winner March 21, taking the 800 meters in a personal-record time of 2:38.5 and the 1,600 in 5:49 at the Pahrump Valley Weekday meet. 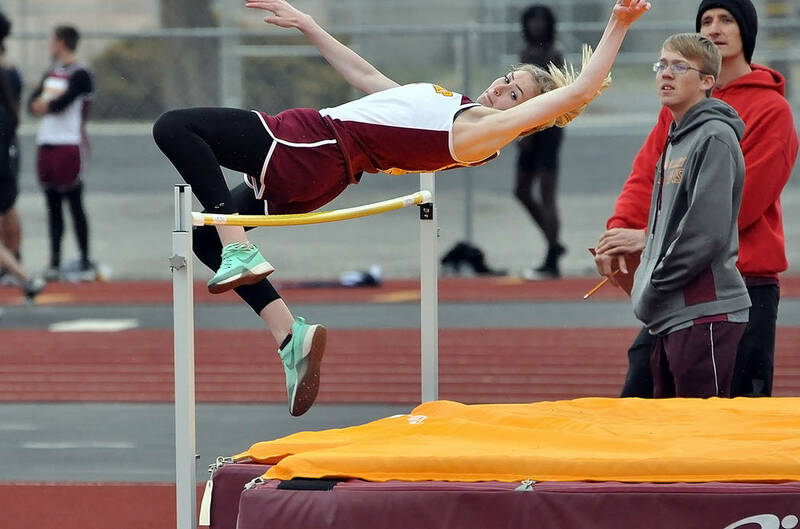 Horace Langford Jr./Pahrump Valley Times Jersey Farnsworth’s personal-record 4 feet, 8 inches led the Trojans to third place in the high jump at the O'Dea Relays at Palo Verde High School in Las Vegas, with Elaina Dattillio and Annabelle Brophy each clearing 4-4. Horace Langford Jr./Pahrump Valley Times Layron Sonerholm of Pahrump Valley competes in the 1,600 meters at the Pahrump Valley Weekday track meet March 21. Off his right shoulder is Brandon Ruud, and behind his left shoulder is Michael Sonerholm. The boys finished seventh in a 17-team field that was mostly Class 4A schools. The only Class 3A school other than Pahrump Valley was Western. “The competition was excellent, and our teams really were giving it their all,” said Trojans coach Fred Schmidt. Jeremy Albertson, who recorded a season-best 155 feet, 9 inches to post the meet’s top effort, combined with Morgan White (112-1) and Brandon Bunker (95-3) to win the discus relay for the Trojans. The Pahrump Valley high jumpers finished second, as Chance Farnsworth equaled his personal record with a 6-foot leap which tied for second. Ethan Whittle cleared 5-6 for the Trojans, while Jacob Sawin posted a season-best 5-4. The other personal record set on the boys’ side came from Grant Odegard, who surpassed his previous best effort by clearing 10-6 in the pole vault. The girls finished in seventh place out of 15 teams at the meet, with their best finish coming in the distance medley. The event features runners going 1,200, 400, 800 and 1,600 meters, with Diamond Sonerholm, Madelyn Souza, Sydney Dennis and Makayla Gent taking second place in a time of 14 minutes, 11.17 seconds. Jersey Farnsworth’s personal-record 4-8 led the Trojans to third place in the high jump, with Elaina Dattillio and Annabelle Brophy each clearing 4-4. The shot put was another high point for the girls, with Jessica Turner (28-3), DeAnndra Shaw (26-2) and Deja Jackson (24-1) among the top 20 individuals. The highest other finish for Pahrump Valley came in the 4×800 meters, as both the boys and girls placed fifth. Jacob Cipollini, Layron Sonerholm, Brandon Ruud and Bryce Odegard ran 8:54.02 on the boys side, while Sydney Dennis, Makayla Gent, Madelyn Souza and Diamond Sonerholm finished in 10:55.43 for the girls. “As a coaching staff we feel that both teams represented themselves as well as the 3A division very well,” Schmidt said. Two days earlier, the Trojans faced a very different level of competition and crushed it, as both the boys and girls won team titles at the Pahrump Valley Weekday meet. The meet had an interesting cross-section of schools, with region rivals such as Del Sol and Cheyenne mixed in with small-school teams such as Beatty, Tonopah and Round Mountain. The Trojan boys easily outdistanced second-place Del Sol 253.5-159 on a wet, windy day in Pahrump. Boys winners included Bryce Odegard in the 1,600 (4:37), Michael Sonerholm in the 3,200 (a personal record 11:25), Kaden Hastings in the 300 hurdles (49.6), Morgan White in the shot put (42-8.25), Albertson in the discus (122-2) and Farnsworth in the high jump (5-10). The Pahrump Valley girls finished with 272 points to beat second-place Cheyenne’s 158. Makayla Gent was a double winner, taking the 800 in a personal-record time of 2:38.5 and the 1,600 in 5:49. Dennis beat out teammate Grace Plumb to win the 3,200 in 13:10 to Plumb’s 13:15. Brophy won the high jump (4-6) and triple jump (27-1.5) for Pahrump Valley. There has been a change to the Trojans’ season schedule. Schmidt said they will bypass the Mt. San Antonio College Relays in California, a meet with high-qualifying standards, and instead head to the Skyhawk Invitational on April 20-21 at Silverado High School in Las Vegas, where more Pahrump Valley athletes will be able to compete. “We feel that our team-before-self concept is better served at the Skyhawk,” Schmidt said.